Infobox last updated on: March 6, 2007. William Lee Shoemaker (August 19, 1931 – October 12, 2003) was one of the greatest American jockeys. The former all-time leader in career victories (8,833), he had 11 victories in Triple Crown races. He also was the first jockey to win over $100 million. Shoemaker rode from 1949 to 1990, winning on 22.9 percent of his mounts. Shoemaker became the most successful jockey in history by winning the Kentucky Derby four times, the Belmont Stakes five times, and the Preakness twice. In 1986, at the age of 54, he became the oldest jockey to win the Kentucky Derby. He retired in 1990 at the age of 60. Despite an auto accident in 1991 that left him paralyzed, Shoemaker worked as a horse trainer until in 1997. Referred to as "Bill," "Willie," and "The Shoe," Shoemaker was born in the town of Fabens, Texas, but spent most of his career on the West Coast, repeatedly winning the most important stakes of his day all over the country. At 2.5 pounds, he was so small at birth that he was not expected to survive the night. Put in a shoebox in the oven to stay warm, Shoemaker survived. His father worked in cotton mills and at odd jobs, and the family moved frequently during the Depression years. When the boy was seven, he went to live on his grandfather's ranch and started riding a horse every day to get the mail. Once, he nearly drowned when he fell into a cattle trough. Shoemaker preferred riding horses to going to school, and he often skipped classes. When he was ten, his parents divorced, and he went to California to live with his father and his new stepmother. At El Monte Union High School, Shoemaker weighed only 80 pounds. He tried out for football and basketball, but the coaches thought he was too little. So he turned to boxing and wrestling, consistently beating boys bigger than him. He never lost a match. A girl at school introduced him to a boy who was a jockey, and Shoemaker started working at a thoroughbred horse ranch. After eleventh grade, he quit school so he could work full-time at the ranch, cleaning the stables and learning about horses. The owner of the ranch was president of Hollywood Park, a racing venue. At the ranch, a retired jockey showed Shoemaker how to ride a thoroughbred. The teenager became immersed in all aspects of training and riding horses. Shoemaker started hanging around California racetracks and became an apprentice to trainer George Reeves. Reeves saw Shoemaker’s talent and interest and gave Shoemaker his start at riding. Shoemaker was only 17 when he rode his first horse in a race, on March 19, 1949, at Golden Gate Fields. His horse, Waxahachie, finished fifth. In his third race, on April 20, Shoemaker entered the winner's circle for the first time, riding a horse named Shafter V. The win was the first of his eventual 8,833 career victories. Reeves at first took a lot of criticism for letting such a young and inexperienced jockey ride, but Shoemaker won seven races in his second week in the saddle. With 219 wins during his first year, Shoemaker rode in every major race. By 1951, he was already a leading rider, winning the George Woolf Memorial Jockey Award. Even for a jockey, Shoemaker was small: four feet, eleven inches and 96 pounds. He did little talking and soon earned the nickname "Silent Shoe." His calm demeanor atop his horses also surprised observers. Most jockeys kicked, whipped. and pulled hard on the reins. Shoemaker became known for his "soft hands" and gentle riding techniques. Two of Shoemaker's most noted rides were at the Kentucky Derby. He lost the 1957 Derby aboard the mount Gallant Man, when he stood up in the stirrups too soon, having momentarily misjudged the finish line. He and Gallant Man ended up finishing second to Bill Hartack aboard Iron Liege. He was the leading American jockey in 1950, 1953, 1954, 1958, and 1959. Until the late 1980s, when purses became inflated, he was also horse racing's top money-winner. He suffered serious injuries in 1968 and 1969 that could have ended his career, but he came back for many successful years of riding. At the 1986 Kentucky Derby, Shoemaker became the oldest jockey ever to win the race (at age 54) aboard the 18-1 long-shot, Ferdinand. The following year, he rode Ferdinand to a victory over Alysheba in the Breeders' Cup Classic to capture Horse of the Year honors. Shoemaker also rode the popular California horse Silky Sullivan, famous for dramatic come-from-behind victories. About this horse he was quoted as saying: "You just had to let him run his race...and if he decided to win it, you'd better hold on because you'd be moving faster than a train." Shoemaker broke the record of jockey Johnny Longden for most wins with his 6,033rd victory in September 1970. Win number 8,833, Shoemaker's last, came at Gulfstream Park, Florida on January 20, 1990 aboard Beau Genius. Two weeks later, on February 3, Shoemaker rode in his last race as a jockey, at California's Santa Anita Park. He finished fourth, aboard a horse by the name of Patchy Groundfog. He won one million dollars during his final nine-month tour. All told, Shoemaker rode in a record 40,350 races. He rode so many fine horses that he found it difficult to identify the best Thoroughbred of his career. He frequently identified three horses as his best: Swaps, early in his career; Spectacular Bid for the middle; and Ferdinand, for the end of his career. However, Shoemaker was once quoted as saying that Spectacular Bid was the best horse he ever rode. In terms of personal performance, he considered his ride aboard Olden Times in the 1962 San Juan Capistrano as one of his finest. In 1999, Shoemaker's own record of 8,833 career victories was broken by Panamanian-born Laffit Pincay Jr.; the record is currently held by Russell Baze. Soon after retiring as a jockey, Shoemaker returned to the track as a trainer, where he had modest success. A car accident on April 8, 1991, left him paralyzed from the neck down and wheelchair-bound, but he continued to train racehorses until his retirement in 1997. Shoemaker sued Ford after the Bronco II he was driving rolled over near San Dimas, California and Ford settled for $1 million. Well, I think maybe that when you're thinking about how bad you feel and "why has this happened to me?" sort of syndrome, just think about other people that might be in your situation and maybe are worse off than you are at the moment and don't ever, ever give up. That's the worst thing you can do. I know some days are tough and you get down and wonder how you would like to be back like you were before. But, that time will come and you believe that it will happen. And, as I said, the most important thing is don't ever, ever, ever give up. Shoemaker died on October 12, 2003, from natural causes. Among those at the funeral were his third wife, Cindy Barnes, who divorced him in 1994, and their daughter, Amanda. One of the greatest jockeys in thoroughbred racing history, Shoemaker racked up an astounding 8,883 victories in 40,350 races from 1949 to 1990, winning more than one out of five races in which he was entered. He won the Kentucky Derby four times, including in 1986 on Ferdinand as the oldest jockey to win the Derby, at 54. He won 11 Triple Crown races. He was the first jockey to win over $100 million. ↑ Interview with Bill Shoemaker. www.latimes.com. Retrieved December 20, 2007. ↑ Mind over Body: Willie Shoemaker" MedicineNet.com. Retrieved December 20, 2007. All links retrieved June 8, 2016. 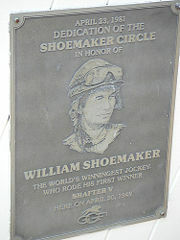 William Shoemaker at the United States National Museum of Racing and Hall of Fame. www.racingmuseum.org. ESPN story Shoemaker made racing history by Ron Flatter. espn.go.com. This page was last modified on 8 June 2016, at 15:17.